- If the GUI looks strange (for example the toolbar buttons) or the application does not function properly, it could be due to interference from previously installed themes or extensions that you migrated along with the rest of your profile. Firefox Thunderbird and SeaMonkey 2 users can try starting up in [[Safe Mode]], which will launch the application with extensions and themes disabled; if the application starts up OK, then extensions/themes are most likely the problem. In this case, you can try exiting the application, deleting the contents of the "chrome" and "extensions" subfolders in your profile folder, and restarting. [http://forums.mozillazine.org/viewtopic.php?p=531797#531797] Be warned that doing so will cause you to lose all installed extensions and themes. + If the GUI looks strange (for example the toolbar buttons) or the application does not function properly, it could be due to interference from previously installed themes or extensions that you migrated along with the rest of your profile. Firefox, Thunderbird and SeaMonkey 2 users can try starting up in [[Safe Mode]], which will launch the application with extensions and themes disabled; if the application starts up OK, then extensions/themes are most likely the problem. In this case, you can try exiting the application, deleting the contents of the "chrome" and "extensions" subfolders in your profile folder, and restarting. [http://forums.mozillazine.org/viewtopic.php?p=531797#531797] Be warned that doing so will cause you to lose all installed extensions and themes. 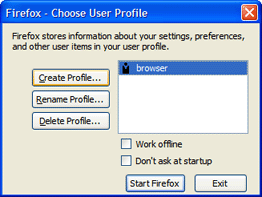 You can verify whether your profile works by launching the application with the -profile "path" [[command line arguments |command line argument]] to specify which profile should be run (see [[Starting your Mozilla application with a specified profile |this article]] for details). That won't solve your immediate problem but it lets you rule out anything that's not profile manager related. You can verify whether your profile works by launching the application with the -profile "path" [[command line arguments |command line argument]] to specify which profile should be run (see [[Starting your Mozilla application with a specified profile |this article]] for details). That won't solve your immediate problem but it lets you rule out anything that's not profile manager related. If the GUI looks strange (for example the toolbar buttons) or the application does not function properly, it could be due to interference from previously installed themes or extensions that you migrated along with the rest of your profile. Firefox, Thunderbird and SeaMonkey 2 users can try starting up in Safe Mode, which will launch the application with extensions and themes disabled; if the application starts up OK, then extensions/themes are most likely the problem. In this case, you can try exiting the application, deleting the contents of the "chrome" and "extensions" subfolders in your profile folder, and restarting. Be warned that doing so will cause you to lose all installed extensions and themes.